The Rabbids attempt to invade Earth and have set up headquarters near a local shopping mall. 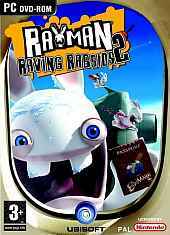 Players have the option to play as a Rabbid or as Rayman, who has disguised himself as a Rabbid to infiltrate their plans. Hordes of crazed out-of control bunnies have invaded, enslaving Rayman and forcing him to participate in "gladiator" style trials. Help Rayman win his freedom back by entertaining and outwitting these fury foes. Use the most hilarious fighting moves imaginable. Run races on animals, fight in the arena, mesmerize the bunnies with your dance moves, throw cows, milk pigs or engage in plunger shooting madness. Unlike the console version, the pc game only contains 16 minigames.